Our pricing is comparable to going factory direct. We will beat any US company's price! Our minimums for pins are the lowest in the industry. If you need even fewer than 25, we'll work with you. Production time is 2-3 weeks from the time you approve your sample. Super complex designs could take longer. Express yourself freely! We believe that beautiful, high-quality hard enamel pins shouldn't cost extra. Below is a small sampling of custom pin orders we have fulfilled for some of our favorite inspiring artists. Soft enamel pin with both glitter and glow. Stadri's original design, for sale at Patches & Pins Expo. Hard enamel narwhal pin with intricate detail. Stadri's original design, for sale at Patches & Pins Expo. Hard enamel pin with glitter by Sara Talmage. Available in her shop. Now more than ever, artists are turning their designs into pins and patches. If you want to turn your original design into a pin, here are some informative guides to give you confidence to get started! Everything you need to know to order the perfect enamel pins is inluded in this handy, step-by-step guide. 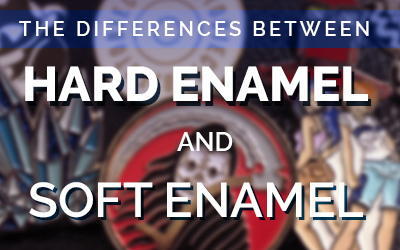 Learn the difference between hard and soft enamel, as well as two other types of pins you may not be aware of. Get your pins made with us, we will be your first backer! 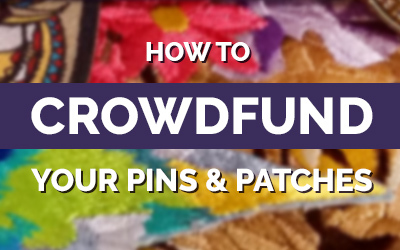 Get tips to help you start a successful crowdfunding campaign. Why should I use your company when I could just go direct to China? It is true that going factory direct is a growing trend in the artist community. With the alleged promise of lower prices, this route can certainly be temping, but is it all it’s cracked up to be? Here are the top reasons you’re better off with us. Ordering from us is stress-free. We’ve already tested and vetted countless factories and established relationships with the ones that we were the most impressed with. The result is a network of trusted sources. If you have any problems or issues, we are right here in the US to provide you with customer service. Unlike most Chinese factories, we will work with you to correct problems and remake your pins for free if you are not satisfied. Our prices are just as good as the majority of Chinese factories we see artists relying on. (See below for more info about how we accomplish this.) You could even argue that they’re better in some cases, because shipping from China is super expensive and ranges anywhere from $35-$70. Not to mention the taxes, duties, and newly-established tariffs that the current presidential administration is imposing on goods imported from China. We handle all this headache for you. Your pins will be shipped from our Woodstock, NY office for only $16.50. You won’t be at the mercy of a single factory’s restrictions. We have a network of factories, meaning that based on your design and specifications, we know exactly which of our factories will do the best job on your pins, and we put care into our decision. To top it off, we have been in the pin industry for over 40 years. We are the ultimate experts in all things pin-related and can recommend the best specs and processes based on your design. Best of all, we genuinely care about the community of pin designers and artists. In fact, we’re one of you. We have artists on staff who are part of the pin and patch community from designing to buying, so we know what kinds of things are important to you. We know the importance of matching your specific colors, picking the perfect metal finish to complement your design, and we know that getting those small details will always be important. We’ve attended Patches & Pins Expo, Flair Fair, Moccafest, and others, and we’re genuinely excited each time we see a new pin order from an artist. Unlike a Chinese factory, you’re never just a number on an invoice to us. How are you able to offer such high quality, especially with prices so low? Most US companies have one factory they work closely with. While this may be convenient for the company itself, it doesn’t always make for the best final product for the customer. We have a network of factories that we work with, and we are well acquainted with each of their strengths and weaknesses. Therefore, based on the specifications of your pin, we can choose the factory that we know will do the best job. For example, one of our factories does consistently beautiful hard and soft enamel pins, but we have other factories that do much higher quality glow-in-the-dark and glitter. With that knowledge, when a customer requires a pin with one of these special options, we know exactly where to send it to get the job done successfully. How are you able to offer pricing that is similar to most of the Chinese factories that I see? Trying to find factories that suit your needs can be a truly overwhelming process. Over the course of many years, we’ve put our blood, sweat, and tears into the process of vetting factories, placing test orders with one factory after another, trying to find the best of the best. While it’s generally true that the higher the quality, the higher the price, during our extensive research process we were able to find some true gems out there that have an amazing balance of price and quality. Can I get fewer than 25 pins made? You can. Technically you can get one pin made, but it’s not worth it. A mold must be created, which is going to run you a minimum of $50. Why pay $50 for one pin when you could get 25x more pins for $99? That is why we advertise a 25-piece minimum, because we’re not big into ripping our customers off, and we feel that selling you under 25 pins would be. But if you insist, we’ll do it. Do I have to give you vector art? No! Unlike most companies, you can give us artwork in any filetype. You can also give us a sketch, description, or even a napkin drawing! We have a full team of artists ready to turn your vision into reality. The best part? We don’t charge extra. Artwork is free with your order. Many factors can influence production times. The majority of custom pin orders will run 2-3 weeks. Designs with a lot of color and complexity or with special options such as glitter, glow, or rainbow could take slightly longer. Orders over 500 pieces will also add a few days to the process. Please note that production time is defined as the time from when you approve your pre-production sample to the time the pins arrive at our headquarters. Shipping can add an additional 1-5 days to that time, depending on where you’re located. I need my pins immediately. Do you offer a rush service? Rush services with custom pins are tricky. Our factories hand-fill the enamel on most orders, which is a process that can’t be rushed without sacrificing quality. We would rather tell a customer that we are unable to fulfill their order in time than offer them an inferior product. In many cases, we can pull off 10 business days, but anything less than that isn’t realistic for pins. There is a 20% fee for rush orders due to the extra labor required to get the pins out in time. Before charging this fee, we will let you know whether or not your particular order can be rushed. I’m against worker exploitation and don’t want to go to China for my pins. We’re against it too! We only use factories that go through vigorous auditing and inspection processes. Our factories are required to provide detailed SMETA and SEDEX reports ensuring fair treatment of employees regarding ethical and safe working conditions and exposure to hazardous chemicals. This audit also enforces overtime caps for workers. We also require SGS reports from our factories certifying that their raw materials are below the legal limits for lead, mercury, and other hazardous materials. Our 40+ years in the industry have given us unparalleled expertise and experience becoming the best in custom products and customer service. 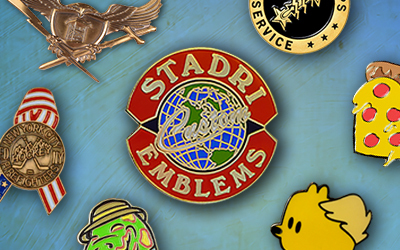 When you order from Stadri Emblems, you know you're ordering with confidence. "I will keep coming back"
"5 stars from me across the board"
I've enjoyed working with Stadri for many years. They have always provided me with outstanding service. On the rare occasion that there was an error, their team responded promptly and corrected the error. They get 5 stars from me across the board. "I have received remarkable service"
I have ordered from here a few times, and each time I have received remarkable service. I received prompt responses to my questions and concerns and the final products were wonderful.